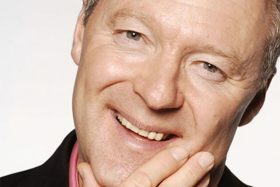 Rory Bremner presents an edgy three part comedy arts series engaging topical comics, satirists and comedians from different countries about their cultures and how they relate to ours – if at all. This is a series of unique and insightful comic encounters into the humour of other nations presented by one of Britain’s most significant topical comedians. Mad bad and dangerous to know, Hans Teeuwen is an absurdist comic performer who takes great risks on stage and has been likened to Bill Hicks and Andy Kaufman. But after the murder of his close friend Theo van Gogh he decided to start performing his Dutch ‘cabaretier’ show in English, to wide acclaim. Rory and Hans explore the world of performance and topical and absurdist comedy, exchanging views and impressions while discussing the risks facing Dutch comics today. The programme features media academic Liesbet van Zoonen of Loughborough University and Rotterdam University. Barry Murphy of Ireland. Described as the Don of Irish comedy by the Irish Times, Barry Murphy has, with his Comedy Cellars club in Dublin watched as his protégé Eddie Izzard, Tommy Tiernan and Dylan Moran have gone on to international fame. Barry Murphy is the most respected topical comic/satirist in Ireland and gives Rory a unique insight into the rich world of Irish satire. With contributions from Mario Rosenstock. Victor Giacobbo has been a satirical presence in Switzerland for the best part of 30 years and uses a variety of comic character creations to illustrate the subtle but active social differences in this well-behaved country. The fact that Switzerland is the oldest culturally integrated, openly democratic country in Europe cannot conceal the absurdities and contradictions found in the political classes and the people of this cheerful, mildly repressed, law-abiding nation.